I´m an English teacher from the Amur Region. I like my job. 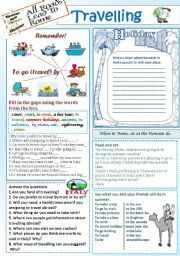 Some exercises to the topic ´Travelling´. 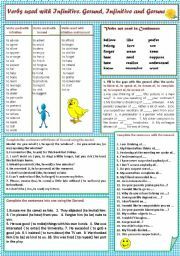 There is a list of verbs using with Gerund, Infinitive, Gerund and Infinitive and some exercises. Hi, everybody! 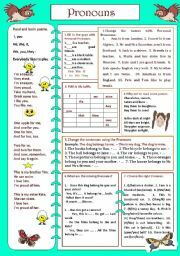 Here is a worksheet for training adverbials of time.Hope it´ll be useful. 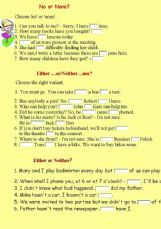 Here is a worksheet to use it for training modal verbs. Interesting exercises for small children. 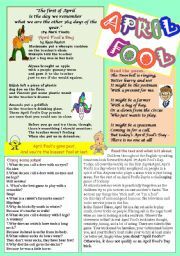 Poems and a text about April Fool´s Day. 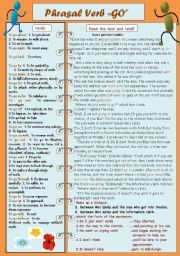 Here is the list of the verb ´go´ with prepositions a text and exercises. 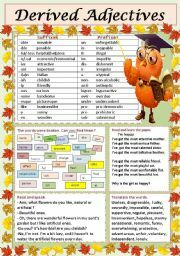 It´s for you and your kids! Have a nice work! 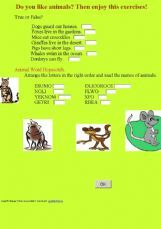 Wordbuilding: Suffixes and Prefixes of Adjectives. 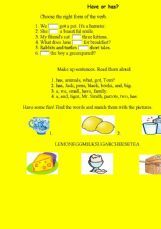 Some exercises for elementary students. I think this exercises will be useful for someone. 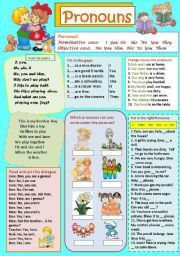 Pronouns ´no´ and ´none´, either ...or/neither ...nor, either/neither. 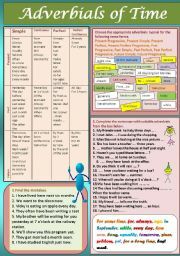 Nice exercises for classroom activities. Enjoy, please. This exercise is good for kids. It is or There is? This exercise will be useful for you, I hope. 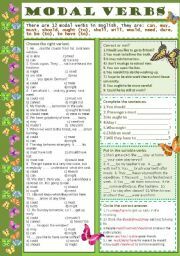 Here students can also practise kinds of questions. 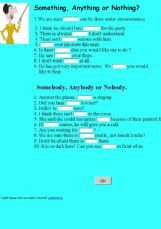 Pronouns - Something, Anything, Nothing, Somebody, Anybody, Nobody. These exercises are interesting to do. You must read the description of the TV programme and type its name.